So I am not usually a wreath kinda person. I mean, don’t get me wrong, I appreciate them, I just couldn’t ever get a vision in my head of what I would want a wreath of my own to look like until I saw this at a blog called Dittle Dattle. Maybe it was that fact that it was already an ‘R’ and there was no visualizing even needed. Or maybe it was those little holly berries peaking around the corner of it cause I DO love holly berries. Either way, I decided to make one for myself. I invited a bunch of lady friends over for an afternoon of kid-free-crafting, aka a Crafternoon. (You can use it, go on, you know you want to). It ended up being a intimate little group of 3 and we chatted over our craft projects and at the end of a couple hours, I ended up with this! Ok, I love it. I really do. I think there may be another Christmas tradition in the making with this one. I basically followed word for word the instructions found in Dittle Dattle’s tutorial above, except for I didn’t spray paint the letter first, mostly because I forgot. I had Hubby cut an R out of a scrap of wood in his shop with a stencil I printed off the computer. I cut a bunch of cedar clippings from our tree in the back yard, picked up some pine cones from the front yard, bought two sprigs of fake holly berries and a pack of green floral wire and voila! 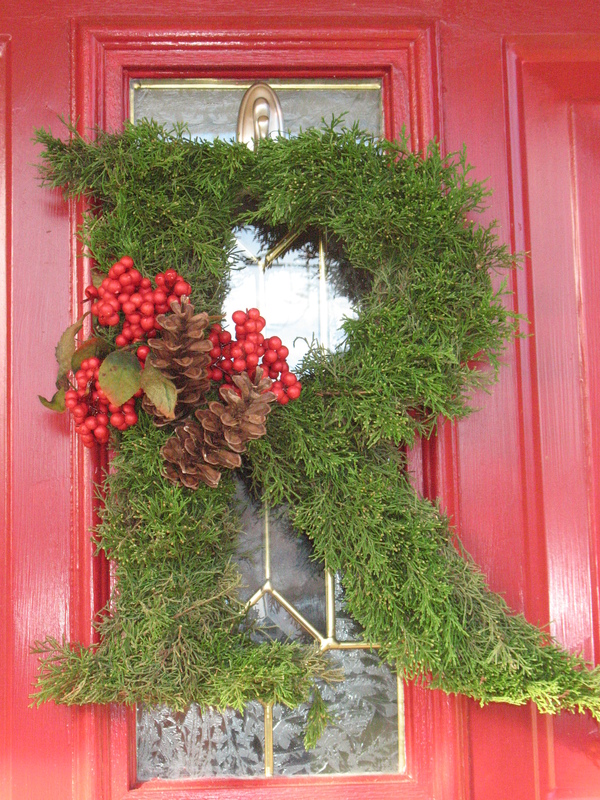 The perfect Christmas wreath for the Robinson Home Sweet Home. Also, as a shout out to my gal pal Sal…she sent me those sweet silver hooks you see on the glass holding the wreath, in the mail as a surprise gift. Not only have these hooks saved our marriage (inside joke, no worries here really), but they have served to warm our front ‘sterp’ and welcome all holiday visitors. Thanks Sal! You’re amazing! I love that so much!! So fun! Oh this couldn’t have turned out better except if it the wreath was hanging on my own door. Wait a second…. I do have one hanging on my door!!! I love it! I wasn’t going to paint the form either but I decided to at the last minute. Lol, sure I’d love to! If I had dark green spray paint I should have used it since my letter was kind of thick, the wood showed through on the sides a bit. This is amazing…it makes me wish I had a house of my own to do this…oh wait, I do! What letter could we use though?! This is a problem. Maybe just a big ‘315’? It would be ghe-tastic. I so wanna make one! I am a big fan of your blog! Hope you can stop over to visit me at Free 2 Be Frugal sometime. Looks so great friend! Very festive! I saw this before and saved the tutorial because I just love it. Hopefully sometime next year I can cut out our initial to have it ready for Christmas next year! Thanks for sharing! You are so amazingly crafty! I love it!!! Hey, I LOVE this! I think monogram-anythings on the front door are so classy! I just don’t think a giant “T” would hang well. It just doesn’t have as satisfying of a shape as an R or an S or H or a whole host of other letters. 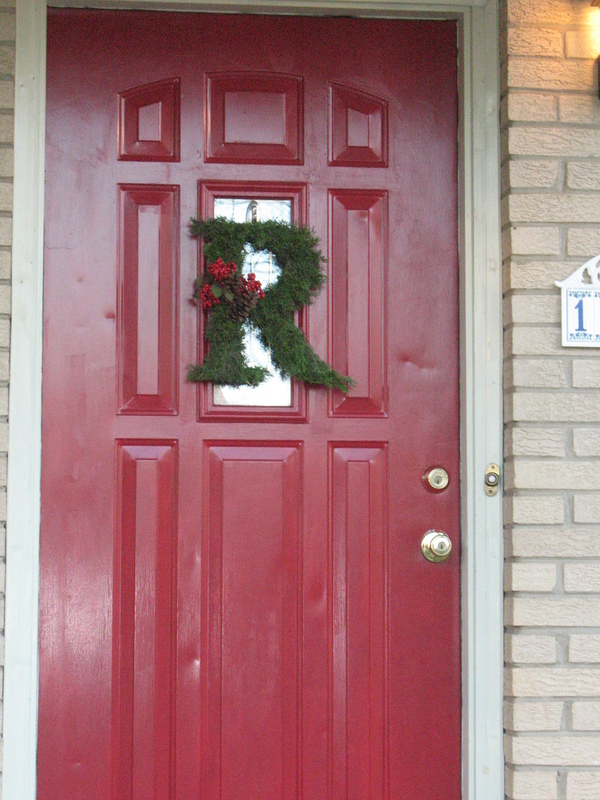 You should figure out how to do monogram R’s for other seasons, too! I’ve seen them done in moss! That’d be a good spring or summer one.